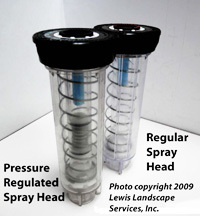 Lewis Landscape Services | Sprinkler Systems Portland Oregon / Irrigation / Rain Bird Contractor Beaverton OR. 1. Save Water and Save Money! Get the same results as your time-based controller but use 50% less water! Traditional controllers are typically set to water a certain amount of time, every day or every other day. For instance, 10 minutes on Monday, 10 minutes on Tuesday, 10 minutes on Wednesday…and so on. 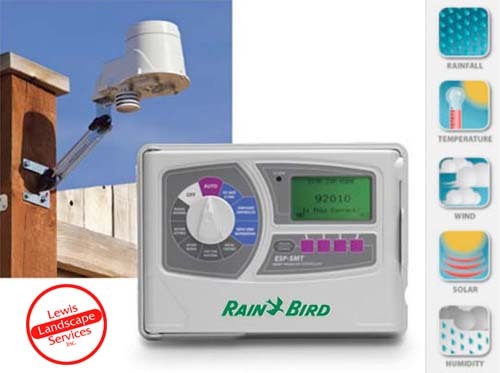 The new Rain Bird ESP-SMT Smart Controller is departure from traditional time-based programming. It monitors 5 weather factors on a daily basis and actually ADJUSTS EACH ZONE FOR YOU EVERY DAY! It’s like having your local weather man custom program your irrigation system for you every day! By regulating pressure and optimizing water pressure at the head, we eliminate fogging, misting, and overspray that can result with regular heads that are given too much water pressure. Each head in your system is now equalized at 30 psi for a balanced, even watering rate – resulting in a 13-29% water savings over the regular heads that most other contractors install. The vast majority of irrigation contractors in the Portland Oregon area are still using your standard spray nozzles that came out 15 years ago. These nozzles are very reliable and are great at throwing water around. But unfortunately, standard nozzles are not at all water efficient. 15 years ago, when they were designed, sprinkler system manufacturers weren’t thinking as much about efficiency. But things have changed in recent years. Recently, due to water restrictions in southern states sprinkler system manufacturers have started to come out with more efficient spray nozzles. There have been several different varieties of spray nozzles that have come out in recent years that were quite a lot more efficient than standard nozzles. But the single most efficient nozzle on the market these days is the Rain Bird High Efficiency Nozzle, or HE-VAN. The Rain Bird HE-VAN nozzle is over 35% more efficient than any standard spray nozzle and even beats all of the other main manufacturer’s “efficient” nozzles (as seen in the chart above). The HE-VAN is what we install with every new irrigation system that we put in the ground. It is just one more way our systems will save you water and money. By combining the high efficiency products above together, our water efficient sprinkler systems will save you $35, $45, $55 or more per month in your water bill, compared to the standard sprinkler systems that the majority of the other Portland irrigation contractors install. Let us come demonstrate to your how our system design will help you use over 50% less water than our competitors’ systems. We offer our exclusive Full 10 Year Parts and Labor warranty – the strongest warranty in the Portland area. Be wary of other Portland Oregon irrigation contractors who offer a short-term warranty. What are they hiding? Why won’t they warranty what they install for more than a couple years? Don’t you think a good irrigation system should last longer than a few years? Well, it should. And ours do! Some companies will even sell you on what looks like a good warranty on the surface – but is only a limited warranty that covers parts only. They will still ding you for labor if something breaks. We stand behind our products and installation. Our warranty is a full parts and labor warranty. If anything goes wrong within the first 10 years, we’ll be out to fix the problem promptly and you won’t pay a dime! We’ve installed more sprinkler systems in the Portland Oregon (West Side) area than most any other company. With literally hundreds of installs under our belt, we have the experience and expertise to install your sprinkler system right, the first time. 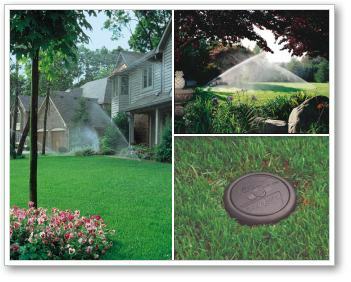 Rain Bird has consistently been the industry leader of the irrigation industry. Rain Bird has developed more irrigation innovations over the years than any other company. As with the weather based controller, pressure-regulated heads, and high efficiency spray nozzles highlighted above, Rain Bird has lead the charge in developing products that are the most reliable and water-efficient products on the market. There is a reason why Rain Bird’s spray heads out sell ALL OTHER BRANDS COMBINED. It’s because contractors around the nation know that their quality and reliability is the best in the industry. We install ONLY Rain Bird products throughout your entire system so you know you’re getting only the best components available. This is what helps us offers such a great warranty. We install the best parts in every component of your system. And we know they last. We are fortunate to be one of a handful of contractors in the Portland area who have been chosen as a Rain Bird Select Contractor. That’s like Rain Bird’s rubber stamp of approval for our company. In order to achieve this accolade, a contractor has to meet some strict criteria for a number of years. Rain Bird checks to make sure we are knowledgeable and know how to install systems properly and according to all proper codes. They audit our installations a few times per year to make sure we are installing all of the components properly. Select contractors have to be doing a fairly large volume of business every year (in other words, they want to see that irrigation isn’t just a sideline for your company). They check our references and make sure our clients are happy with our company, workers, and the work we did. And finally, Rain Bird makes sure their Select Contractors are provided with a lot of continuing education each year so we are always up to date on the latest water-savings products. After a few years of meeting these guidelines (and many more) Rain Bird offers their endorsement in the form of the Select Contractor program. 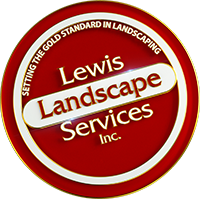 Lewis Landscape attained that honor in 2006 and we have been honored to continue to maintain our status in the program ever since. In fact, we were honored at the 2012 Select Contractor conference with an award from Rain Bird for maintaining our Select Contractor status for 5 straight years. Our partnership with Rain Bird has been one of continued trust and benefit for our mutual customers. In addition to being a Rain Bird Select Contractor, our head irrigation contractor, Jim Lewis, is one of 15 contractors nationwide to be selected to be on the Rain Bird Contractor Advisory Board. Jim was also selected as one of only 5 irrigation contractors to speak at the 2009 Annual Rain Bird Select Contractor Conference. His topic was teaching other contractors at the conference a case study of how we install super efficient sprinkler systems using Rain Bird components and how we saved each of our clients thousands of gallons of water each year using these practices. Why is it most companies don’t offer more than a 1 or 2 year warranty on their sprinkler system installations? If they were using quality components and taking the time to install a good system, don’t you think the system should last longer than a year or two? Well, it should! And we find that if we do it right the first time, we can rest assured that our work will stand the test of time. The very reason we have a Full Time irrigation repair technician on staff is because there are so many irrigators out there who are installing systems that fall apart fairly quickly. If you take your time and do a job right, it should last. And we have hundreds of happy customers who will be glad to testify to this. 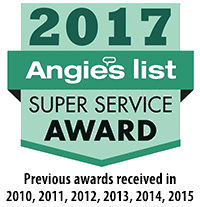 Find out why Lewis Landscape Services installs more residential sprinkler systems in the Portland Oregon (West Side) than any other irrigation company in the area. Investing in a landscape irrigation system is a big investment. Hiring the right contractor can make a huge difference. Along with our detailed bid, you’ll be provided with a long list of references in your area of installation customers of ours who you can call to check on our work. Soon you too will find out what our happy customers are raving about. 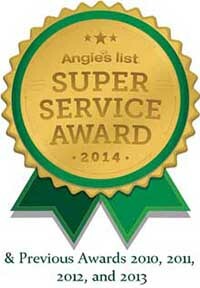 In addition, Lewis Landscape Services also comes highly rated on the top online review sites (see below). We also maintain an A+ rating with and are accredited by the Better Business Bureau. We will not leave your property a mess. We will clean up our entire jobsite and double-check everything before we leave. Your sidewalks, driveway and street will be cleaned thoroughly before we leave. Your neighbors will appreciate it as much as you will. Some contractors skip out on things like utility locates, backflow permits, backflow tests, final inspection, clean-up, and a system walk through. We’ll cover all these things for you – without you having to ask us. You’ll find our quality and service to be among the best of ANY company in the Portland area. But you’ll be happy to find that we’re not the most expensive. We aren’t the cheapest company in town either. But in terms of value, I think you’ll agree that we offer a system that has the best value in town. And our systems will save you so much more in the long run than the systems most Portland irrigation contractors install. Give us a few minutes to evaluate your irrigation system needs and we’ll help you understand why having a Rain Bird Select Contractor can mean the difference between a contractor who knows how to install sprinklers and a well trained contractor who specializes in engineering and installing the very best, most efficient systems available today. Give us 30 minutes to evaluate your property and explain how your new system would work. You’ll have a complete estimate right on the spot and you’ll gain some valuable information about irrigation systems and how we can save you time and money! To begin the design process simply complete our online quote request form and one of our Portland or Beaverton Oregon area Irrigation Systems experts will contact you promptly to set up an appointment for a free estimate. Lewis Landscape Services of Beaverton Oregon, specializes in Rain Bird Irrigation Systems installation in the SW Portland Oregon area, and surrounding cities. See our Service Areas section for more details.